A complete body groomer that takes care of you from head to toe is a must have for any metro-sexual man. But most of them which are available in the market are so expensive that not everybody can afford one. Remington PG525 Body groomer is an exception to the rule. It comes at a price at which it is difficult to get even a decent beard trimmer. But that does not mean that Remington has compromised a lot on the product to make it available at such a throw away price. Let’s have a clear insight into the product details and decide for ourselves if it is worth the buy. The Remington PG525 Body groomer is a long and sleek rectangular device. It has an elegant black and grey plastic body which is slightly tapered at the upper half. The black glossy part is complemented by the textured part in grey. This grey textured part provides an anti slip grip and fits into your hands snugly. This ergonomic design is perfect for a comfortable grip and makes it easier for you to maneuver it. It has a single power switch located at the centre of the handle. So you do not have to rack your brains to be able to use it. You just need to know the jobs done by each of the attachments and then shuffle the attachments to suit your needs. All the attachment heads have lined grooves at their bases so that they provide the grip for detaching them from the groomer handle. The plastic body of the groomer as well as its attachments is tough and durable. The Remington PG525 Body groomer has all the attachments that you require for a complete body grooming session. The groomer includes a full size beard trimmer, a foil shaver, a nose and ear trimmer and various comb attachments. The full sized trimmer that comes with the Remington PG525 Body groomer is equipped with two surgical steel blades. These blades are self sharpening in nature. This makes them more durable and their sharpness is maintained over a long period of time. 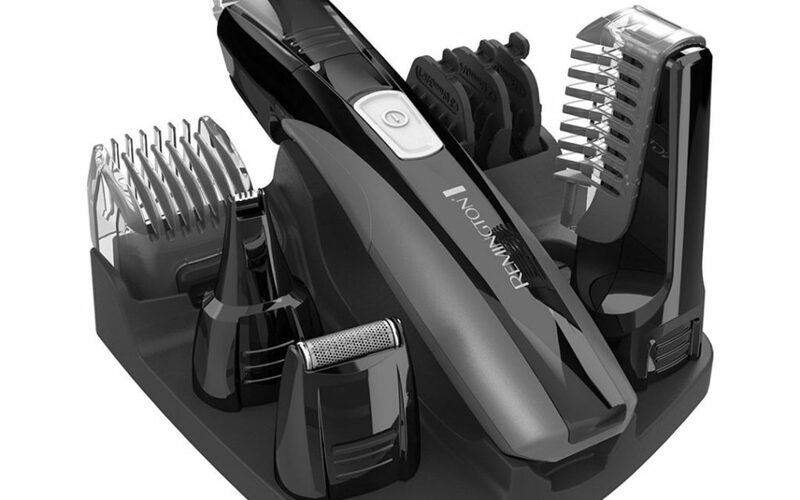 The full sized trimmer adds precision to your moustache and sideburns and can be also used as a beard trimmer by attaching the different snap on attachments that come along with it. There are three fixed trimmer combs of 3mm, 6mm and 9mm respectively. 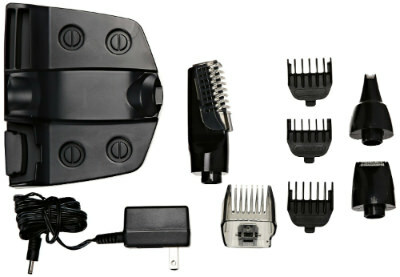 There is also an adjustable hair clipper comb. This comb has 8 adjustable lock in length settings i.e. it can be locked at the following lengths viz. 2mm, 4mm, 6mm, 8mm, 10mm, 12mm, 14mm and 16mm respectively. The foil shaver in the Remington PG525 Body groomer has a single foil cutting element. It’s simple in design. The ultra thin foil has numerous pores that enable the shaver to reach as close to the skin as possible and the inner surgical steel blades then snip off the strands giving you a close and smooth shave. The foil shaver as its name suggests acts as a shaver and is especially useful for the neck, chin and jawline. The nose, ear and eyebrow trimmer narrows at the apex to reach the areas inside the nose and the ear easily. These areas can never be taken care of by the foil or full sized trimmers. The surgical steel blades at the peak of the trimmer snips off the hairs from the base without hurting you in these super-sensitive areas including the eyebrows. These ultra sharp blades also avoid pulling and tugging. The vertical body hair trimmer is not something you get to see often. 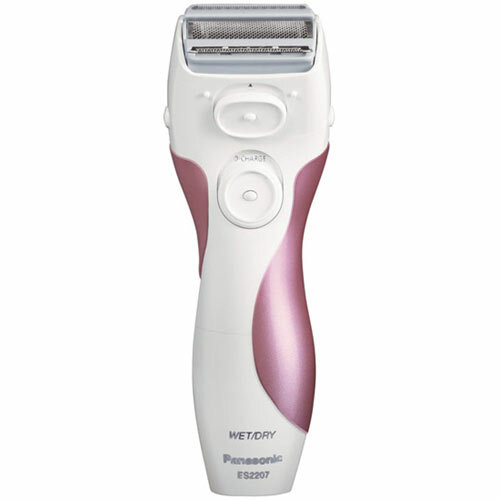 It’s specially designed to tackle the body hairs and to glide smoothly across various parts of the body. It has three adjustable length settings so that you can set it to the desired length and work your way through. The vertical design helps to work over a bigger area in a single pass. The Remington PG525 Body groomer is powered by a Lithium battery. It takes about 4 hours to get fully charged and can give you up to 70 minutes of cordless usage. This means that the groomer can be used cordless for a long period of time. The lithium battery ensures that the groomer receives the same power throughout the battery life and works with equal efficiency all along. There is a charging and battery status indicator just below the power button. The charging stand that comes with the kit holds all the attachments together and is perfect for your bathroom rack. Now you do not have to worry about losing that extra attachment that had been tucked in the drawer. The groomer is also suitable for corded use. The Remington PG525 Body groomer does not require a fancy cleansing dock, It is 100% waterproof and each attachment can be rinsed under a faucet individually. There is no additional maintenance required. The grooming kit has to be cleaned after every use. The groomer can be used both dry as well as in wet mode. You can even take it to your shower if you prefer. Use of gels or lotions or shaving creams is also possible. With a lotion you will get that extra smooth feeling. The Remington PG525 Body groomer comes with a two year limited warranty on the product from the date of purchase. It is also backed with a 60 days money back guarantee wherein you get full refund if you are not satisfied and return it to the manufacturer. This money back guarantee itself is a proof of the quality of the product. Being the basic model in the body grooming series, it lacks some of the features of the high end models, but it excels in delivering the basic simple functions that it is supposed to in style. And with the price that it comes in, you would definitely want to keep it handy.